At Earth Diggers safety standards are maintained while performing Trenching and Pest Holes Gawler. There are experienced professionals in our fleet of workers who work with all dedication to extend support through our services. We work with various kinds of instruments and it might turn hazardous if not operated by experts. 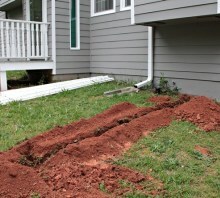 Technology is developing each day to make the task of trenching easy. Our company matches the pace of technology to include new machinery. Training is given to all employees regarding the usage of new machines that are launched. It’s a continuous learning process that enables us to improve and compete our own standards reaching perfection.